Accompanying with Warm breeze and bright sunshine of spring. In order to celebrate May 1 International Labor Day and 23rd anniversary of China Transport Group, on the afternoon of April 28, all the employees of Shandong China Transport Group gathered together to hold 'Years of Glory Brilliant by Honest'art show for celebrating International Labor Day and 23rd Anniversary of China Transport Group Establishment. A number of leaders and guests attended the meeting under special invitation including Jining College Institute Vice President Zhu Songtao, Jining Municipal Commission of Economy and Information Technology Researcher, Provincial Information Technology Industry Office Director Wang Youbing, Deputy Director of Municipal Government Office Qi Guanglin, Jining Light Industry Textile Industry Office Director Li Guangji, Vice Chairman of the Municipal Federation of Industry and Commerce Jiao Jundao, Municipal Shipping Bureau General Manager Liu Quan, High Tech Zone Social Development Bureau Director Zhao Lu, High-tech Zone Local Taxation Bureau Union President Zhang Jianning, High Tech Zone District Communist Youth League Secretary Li, High-tech Zone Party Group Work Department(Party Working Committee United Front Work Department) Deputy Minister, Women's Work Committee Deputy Director, Binhe Science and Technology Park Director Cai Xinguo, Wenshang County Local Taxation Bureau Wang Baoliang, Jiezhuang Street Party Secretary Yang Yixuan, Jiezhuang Street Party Vice Secretary Sun Dexiang, Jining College school-enterprise Cooperation Office Director Zhu Guilin, Dean of Business School of Shandong Polytechnic College Chen Guo Min, Sanjia Police Station Deputy Director Xue Faqiang, Jining City Unicom Director Yang Rui, Rizhao Bank Vice President Yang Jing, Sun Maofeng, Huaxia Bank Micro-Finance Department General Manager Liu Shenglin, Shengda Group General Manager Ai Huaxin, Gouji Mall General Manager Wang Guangtian, People Network Reporter Hu Zhaogai, Gong Ming Zheng He Law Firm Legal Adviser Yang Jie, Sun Fangjie and many other leaders. Chairman and General Manager of China Transport Group Qu Qing, Group Deputy General Manager Han Yong, Feng Zhenying, Li Zhenbo, Deputy General Manager Fan Pei Gong, Sun Shijun, Guan Chenghui and other group leaders attended the celebration. Time flies, China Transport Group has gone through twenty-three years. Today's glory is not overnight fame, every harvest is permeated with the story of the struggle of China Transport people. In order to let everyone better feel, review twenty-three years process of establishment - development - growth, all the participants watched the China Transport Group 23 years’ development history documentary. 1994 - 2017, 23 years’ time, China Transport Group developed from a small company with only a dozen individuals into a modern enterprise with more than 600 employees; from rental office to own independent e-commerce Industrial park; from a single industrial and mining machinery industry to cross-industry, diversification; from the traditional industrial and mining enterprise to national enterprise information construction leader, all China Transport people under wise guidance of leadership, hard enterprising, pioneering and innovating, bear a lot of tests, in this rapid development new era, persistent tenacious hard work all the way, grew into the industrial and mining machinery industry leader, e-commerce leader. Before the ceremony, Jining High-tech Zone Binhe Science and Technology Park Director Cai Xinguo was invited to deliver a speech. Director Cai firstly represented high-tech zone Binhe Science and Technology Park Party Committee expressing a grand congratulation on the 23rd anniversary of establishment of China Transport Group. In his speech, Director Cai spoke highly of China Transport Group's outstanding achievements in e-commerce, cross-border e-commerce and high-end intelligent equipment manufacturing. He said China Transport Group, as a successful example of transformation from traditional enterprise to modern enterprise, its all-round, high-level, multi-field global development strategy is very worthy of the majority of small and medium enterprises to learn from, is benchmark for the development of industrial enterprises of Jining City and even Shandong Province, in the next step, hope that China Transport Group continual pioneer and innovative, exemplary take the leading role of the city to promote rapid transformation of traditional enterprises! Jining City High - tech Zone Jiezhuang Street Party Secretary Yang Yixuan pointed out that China Transport Group after 23 years development, from an unknown small company grow into a diversified, multi-domain development international group, has made outstanding achievements in the field of e-commerce, cross-border e-commerce, software research and development, high-tech agriculture, intelligent logistics, Intelligent equipment manufacturing and other industries, the products sell well in 34 provinces and autonomous regions, and world's 148 countries and regions, made outstanding contributions for the development of Jiezhuang street, set an example to the city's traditional industrial enterprises. Hope that China Transport Group to promote the successful experiences, so that more enterprises would be benefited, more power business talents would be cultivated for community! Jining City Municipal Commission of Economy and Information Technology Director Wang was invited for an important speech. Director Wang with concise language summed up the achievements of China Transport Group, he said, China Transport Group can have today's achievements all from the five good resources, good way of developing Internet, good vision of leadership, good corporation of leadership teams, good quality of staffs, good social response from integrity management, the five good resources made today's brilliant of China Transport Group. Director Wang pointed out that next step, China Transport Group as the province's e-commerce demonstration enterprise, must follow the pace of national Internet development for future development, continue to play a scientific and technological innovation and exemplary role, to speed up technological innovation, modernization in management, and comprehensively enhance Group's global competitiveness, realize China Transport Group century base! The whole show opening by sonorous and powerful and exciting " Drums Flourishing ", festive atmosphere of joy filled the stage with an instant. Wonderful instruments combination won the audience bursts of applause. With the melodious melody, Jining Academy dancers offered classical dance "Cai Wei", performers with graceful grace, costumes fluttering, As if take the audience into the Han and Tang Dynasties; followed by aerobics performances, opera " Mu Guiying Takes Command", combination of songs, vocal solo, wonderful programs take atmosphere once again to the climax, live songs and dances bursts, bustling, presented a fantastic audiovisual feast. 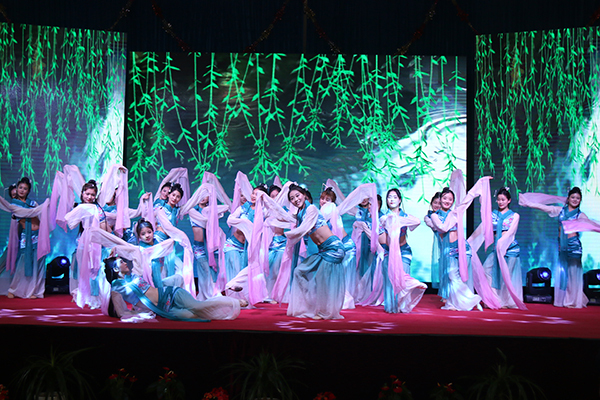 Same time as program performing, in order to better promote atmosphere, also set up a live ‘red envelope’ interactive which greatly mobilize the enthusiasm of each employee, improve the enthusiasm of employees to participate in, for a time, China Transport assemble hall became the sea of joy. 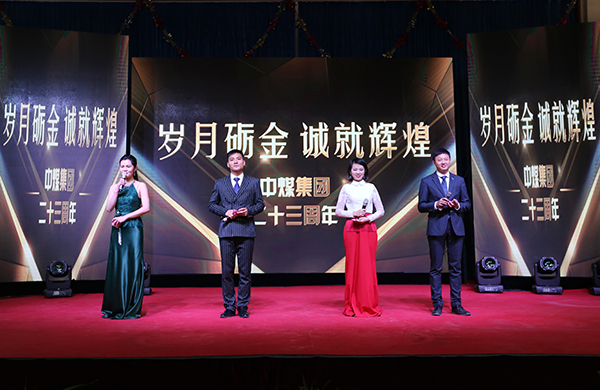 Time is always short, three-hours-art show came to an end in the audience applause and cheers, the song "better and better" expressed the voice of everyone to wish the motherland prosperity, wish the new glory of China Transport Group. The Singing intersection, passion blend, passionate melody reverberated in the hall for a long time. Twenty-three seasons, the community witnessed the thriving growth of China Transport Group. Achievements only represent the past, forge ahead to show brilliant. Looking to the future, we are full of confidence. Twenty-three years old, it is a energetic and vigorous age, and also an age to be mature. We believe that China Transport people will be more persistent, more determined, twenty-three grinding sword, ready to go, as long as we always full of passion, united as one, China Transport Group will move toward to a more brilliant tomorrow!